The most successful business owners know what they do best and hire outside experts to take care of the rest. By outsourcing your IT you can have company resources focus on the primary business of your organization and move ahead. Your business needs similar or better technologies in place than your competitors to not only compete but succeed. All Business Technologies has IT services and solutions in place that will help take your business to the next level. Our Managed IT Services are geared to give your business enterprise level type support at a small to medium business price. The best way we can describe this service is that it is like buying a time share of an enterprise level IT department. As your trusted technology adviser we can oversee your businesses entire technological needs. We will provide the regular management of your systems and networks to ensure your business stays up, running, and profitable. We will put together the best IT solutions for your business. All Business Technologies monitors your devices for early warnings of potential threats to your business network. We are able to monitor you entire network and receive alerts from computers, servers, routers, switches, firewalls and applications if a problem gets detected. All Business Technologies will proactively perform all Windows and Software updates to keep you devices secure. We are also able to automate much of your needed IT tasks such as patch management off hours to keep you up and productive during business hours. Cloud IT is the future of business technologies that will save you money and increase efficiency. The recent boom in the capabilities of utility computing in the cloud presents many businesses with alternative ways of substantially enhancing production anywhere there is Internet. Disaster can strike any business without warning. Having a solid backup and disaster recovery plan is vital to any businesses long term success. All business Technologies we uses both on premises backups and well as cloud based backups so your data is always redundantly protected. Even the most stable of networks can have problems from time to time. We understand downtime is a profit killer to businesses. Our staff can remotely connect within minutes to try to resolve the issue. On rare occasion that is not enough we can dispatch a tech to your location. Your dedicated Virtual CIO will help your organization through strategic planning that will build out a long term IT plan that will save your business money. We will also manage all your vendor relationships giving you no more wasted time dealing with 3rd party support. 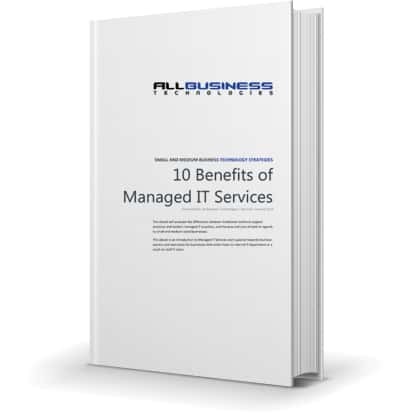 Download this Ebook about How Our Managed IT Services Can Benefit Your Business.